Providing the Sixth Amendment right to effective assistance of counsel is a state obligation under the Fourteenth Amendment. The State of Oregon attempts to fulfill its obligation to provide effective right to counsel services in trial courts primarily through an array of contracts let by the Public Defense Services Commission (PDSC), and administered by the Office of Public Defense Services (OPDS), with public defender offices, private law firms, consortia of individual attorneys and law firms, non-profit organizations, and occasionally individual lawyers. In doing so, the state has created a complex bureaucracy that collects a significant amount of indigent defense data, yet does not provide sufficient oversight or financial accountability. In some instances, the complex bureaucracy is itself a hindrance to effective assistance of counsel. Moreover, the report concludes that this complex bureaucracy obscures an attorney compensation plan that is at root a fixed fee contract system that pits appointed lawyers’ financial self-interest against the due process rights of their clients, and is prohibited by national public defense standards. These are the conclusions of a report by the Sixth Amendment Center, The Right to Counsel in Oregon: Evaluation of Trial Level Public Defense Representation Provided Through the Office of Public Defense Services (January 2019). The report was prepared for the Oregon Public Defense Services Commission, a state agency responsible for establishing and maintaining the public defense system for Oregon’s entire state courts system. The 6AC finds that PDSC and OPDS devolve onto their contractors the state’s responsibilities under the Fourteenth Amendment, including the selection of the individual attorneys who provide the right to counsel, how those individual attorneys are appointed to the cases of specific defendants, and how and how much the individual attorneys are paid for their work. The complex PDSC/OPDS bureaucracy hides a stunning lack of oversight. That is, PDSC/OPDS do not have any way of knowing who the attorneys are or how many attorneys are providing right to counsel services on any given day, and the State of Oregon cannot ensure the lawyers appointed in each case are actually qualified to handle effectively the cases to which they are assigned. PDSC/OPDS do not require the contracting entities to explain how much money is spent on overhead and what is acquired, how much money is paid to a contract administrator and what services are provided in exchange, or how much money is paid to the constituent individual attorneys and what services those attorneys provide in exchange. Oregon’s complex bureaucracy obscures an attorney compensation plan that is at root a fixed fee contract system that pits appointed lawyers’ financial self-interest against the due process rights of their clients. This compensation plan creates an incentive for most attorneys to handle as many cases as possible and to do so as quickly as possible, rather than focusing on their ethical duty of achieving the client’s case-related goals. Not surprisingly, examples of excessive caseloads abound throughout the state. In addition, in a compensation structure that emphasizes “case credits” over effectiveness, contract providers lack resources to ensure appropriate training and supervision of their individual attorneys. The 6AC recommends that the State of Oregon abolish fixed fee contracting (and the excessively low $46 hourly rate paid to individual attorneys outside of the contract system) that produces disincentives for public defense lawyers to provide effective assistance of counsel. Oregon should either pay private lawyers at an hourly rate that accounts for both actual overhead and a reasonable fee or hire adequately compensated and resourced government-employed public defenders for trial-level services. In order for PDSC to effectively exercise its authority, it is imperative that the statutory language be amended to ensure that the commission’s members are appointed by diverse authorities so that all branches of government are involved in and responsible for the effective provision of the Sixth Amendment right to counsel. 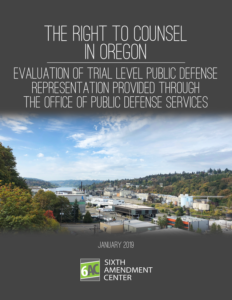 The Right to Counsel in Oregon: Evaluation of Trial Level Public Defense Representation Provided Through the Office of Public Defense Services (January 2019), is available from the Sixth Amendment Center in electronic format only.